Planet Ill – Review of Food Will Win the War Album – Nov 2012 – Click here to read. Huffington Post – Review of Food Will Win the War opening for The Lemonheads at The Knitting Factory – Jan 2012 – Click here to read. Gigape – Review of Food Will Win the War opening for The Lemonheads at The Knitting Factory – Jan 2012 – Click here to read. Cambridge Today – Food Will Win the War – Fall 2011 – Click here to read. Interview Magazine – Interview of Food Will Win the War – Fall 2011 – Click here to read. Williamsburg NY Blog – Food Will Win the War – Fall 2011 – Click here to read. The Deli Magazine – Interview with Food Will Win the War – March 2011 – Click here to read. The Deli Magazine – CMJ Show at Mercury Lounge, NYC Show Review – Food Will Win the War- Fall 2010 – Click here to read. State of Mind Magazine – Review: A Million Grains Of Sand, Winter 2009 – Click here to read. Earvolution.com – Review: A Million Grains Of Sand, October 2008 – Click here to read. Healthy Hippie Magazine – Review: A Million Grains Of Sand, September 2008 – Click here to read. Jambands.com – Review/ Interview: Counting Up A Million Grains Of Sand, September 2008 – Click here to read. 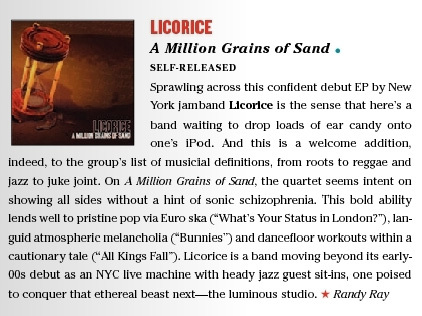 Relix Magazine – CD Review: A Million Grains of Sand, August 2008 – Click here to read. WMUC FM 88.1 – Interview/ On-air performance, August 2008 – Click here to stream. Gratefulweb.net – Band of the Month, June 2008 – Click here to read. Earvolution.com – A Night of New Grooves, February 2008 – Click here to read. Earvolution.com – 1:00 a.m. Is The New 10:00 p.m., October 2006 – Click here to read. Earvolution.com – Licorice @ Sin-e, August 2006 – Click here to read. Earvolution.com – Licorice Creates Some Old Magic at Coda, May 2006 – Click here to read. Earvolution.com – A Tasty Treat: Licorice at the Blue Note, January 2006 – Click here to read. Jambands.com – New Groove of the Month, October 2005 – Click here to read. Channel 13, Telluride, CO – Interview, August 2005 – Click here to watch. The Telluride Watch – Jazz Gets Funky Late Night, August 2005 – Click her to read. The Telluride Daily Planet – What’s Goin’ On, August 2005 – Click here to read. Relix Magazine – On the Verge, July 2005 – Click here to read.